The news that the whole exoplanet was artificial shocked Dranke and Piteer as much as it had Fenie. The two crew members of the darkmatter starcraft stood rooted to the spot where they had introduced the probe into the soft soil of the planet. Dranke asked Fenie "Can you scan to see if there is any activity on this planet under the crust?" He got the reply he feared "We can't do anything more than a very basic scan. There is too much material for us to do a detailed scan captain." 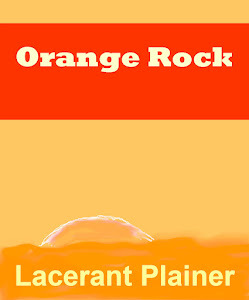 He gestured to Piteer to walk with him as he walked across the crater floor, looking for clues. Dranke and his crew were searching for the alien fleet which they had tracked across the Milky Way galactic disk, but finding the Hnnet was proving to be more difficult than they had imagined. Spacecommand had tasked the Raven to search the neighboring galaxies for the mysterious alien called 'Ed.' After searching a number of planets, they had still to find the aliens they were looking for. Dranke and Piteer did a circular visual scan, but nothing stood out which could provide any clue to the reason this planet existed. It was frustrating, and after a few hours, Dranke called off the search and they headed back to the Raven. On exiting the airlock inside the ship, they pulled off their suits in relief, it was getting warm. Vaxe looked at the screen and said almost to herself "That's funny, it seems that we are circling a star which does not exist. 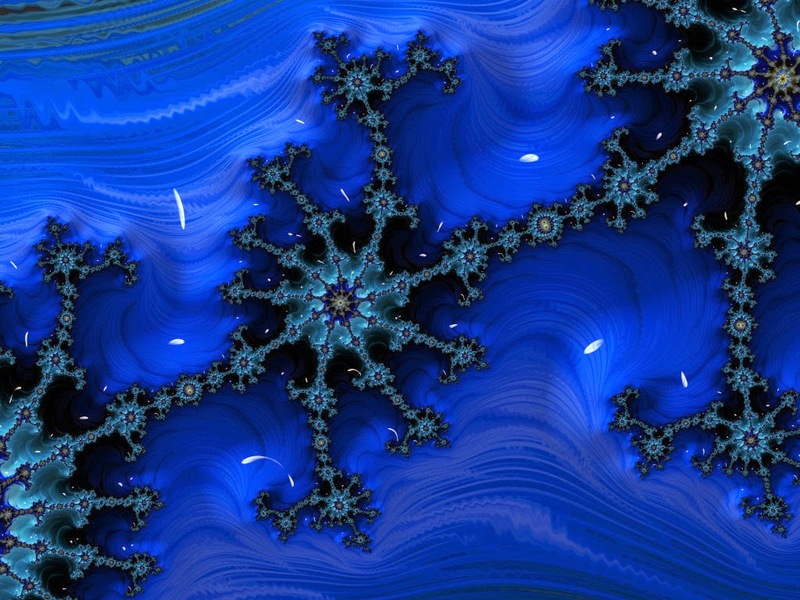 At least that's what the simulation seems to indicate." Fenie looked at the visual representation "What does that mean?" Vaxe explained "It seems that the planet is following an orbit which would make sense in a binary system. Except there is no other star. 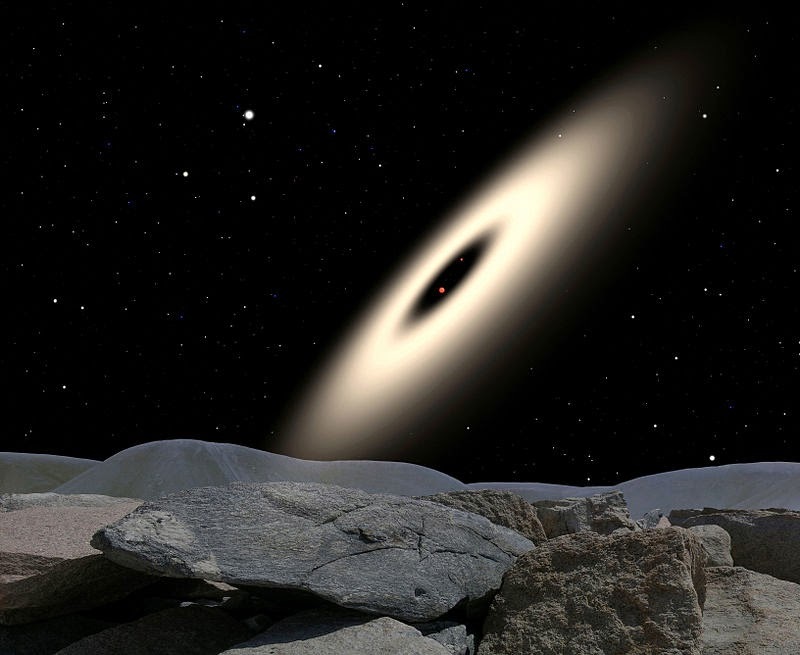 Not even a black hole, since we did a scan and there is no gravitational lensing." It was now Fenie's turn to look mystified, as she peered at the numbers wondering if there had been an error. Dranke asked for the simulation to be sent to his console and he looked at the simulation. It seemed to be sound. Vaxe had a frown on her face as she muttered "What if the missing star and planet are linked?" It sounded ludicrous, but nothing else made sense. The Universe followed the laws of spacetime. How were they supposed to interpret this? Without warning, the Raven lifted off and seemed to be rapidly heading for the missing star. Dranke started out of his seat and yelled "Situation report! What's going on?" The engines showed no activity and yet they seemed to be pulled into the dark spot. Fenie looked apologetic "No idea captain. We just lost control. It might well be the Hnnet." They waited. There was nothing else to be done. Whatever had them in it's control had rendered them helpless, and they were at its mercy. In a few moments, they stopped slowly as if they had been flying through treacle and the ship was stationary. Without preamble, an artificial airlock appeared from the side of their darkmatter starcraft. Maybe this was the Hnnet after all! Dranke felt almost relieved as he waited for the familiar round globular alien to appear. Instead there was a bluish green probe which snaked through the opening. It slithered into the ship and seemed to be looking around. It inspected everything. Without warning the probe's tip pointed at Dranke. He moved back slowly. The tip withdrew slowly too. Vaxe tried to approach the probe from the side. It whipped at her threateningly. She stood very still. After a few minutes the probe withdrew. It seemed to melt into the artificial airlock, which closed rapidly behind it. Vaxe tried to communicate with whatever was outside, but there was no signal. The sensors did not show anything at all. Dranke took a deep breath "Whatever that was, it was definitely not friendly." The others were too shocked to say anything. Piteer announced that they were released from whatever was holding them. There was no answers. Unaware of what was transpiring with the Mescieans, Dranke saw that his crew had already plotted a path to another star system which was very close to the jump exit. The star system was unremarkable by itself, but something had attracted Fenie and Piteer's interest. It had a very strange exoplanet, which seemed to circle not the central star, but was circling another area a little way off from the star. By itself, the planet was unremarkable. But its very behavior was puzzling in the extreme. The exoplanet seemed to have a mind of it's own. After looking for the elusive Hnnet in the nearby Sagittarius satellite galaxy, Dranke, the captain of the Raven had pushed his crew to chase down the technologically superior aliens in the vicinity of the Milky Way galaxy. Starcommand had tasked the Raven and her crew to track down the alien species to their homebase, which was easier said than done. Dranke had chosen the Sagittarius satellite galaxy as the most likely candidate, and after visiting a number of planets, they had refined their search so that they could track down the elusive 'Ed'. During their explorations of a planet which had seemed to be an outlier, they were oblivious of having met an intelligent species called the Mescieans. 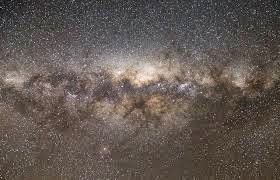 The star system sat on the edge of one of the arms of the galactic disk and right next to it was the Omega Centauri galaxy, which beckoned to them invitingly. Dranke almost decided to make the jumps required to leave Sagittarius behind. But he decided to follow the plan "Does the planet show any electromagnetic emissions?" He was getting to be a little testy from his tone. He caught himself. Dex was now in charge of the scans and he replied without looking up from his console "Pretty sure there is nothing. But it could be shielded." Dex always double-guessed himself in case he was wrong. Vaxe grinned "Dex is right. Nothing there sir. What should we do?" Dranke looked resigned "Land I guess. We need to strike this off too." Fenie was already getting ready for landing, her face a study of concentration as she looked at the atmosphere composition, temperatures and external conditions. Piteer was busy getting suited up as the autopilot had taken over and he was now a veteran of landings, needing very little preparation. One was very similar to another. 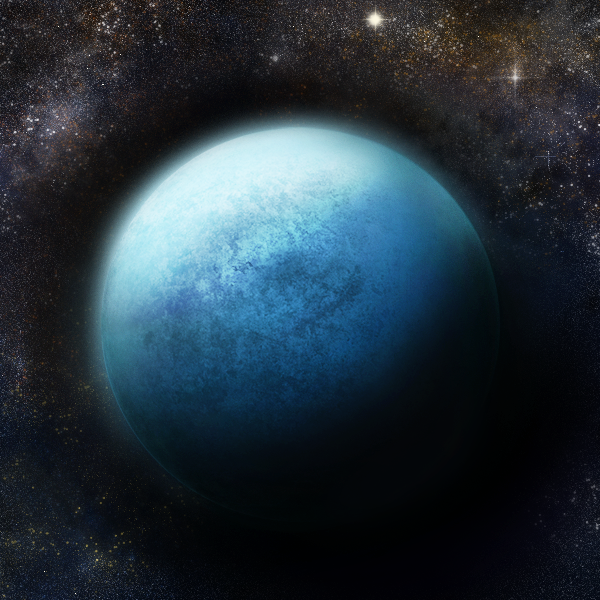 Dranke checked to see that the blue ringed exoplanet that swam into view was not a gas giant, but the core seemed solid. Time to suit up. He got to it. They had found a good landing spot on a crater and Dranke and Piteer stepped out the airlock to see the crazy movement of the planet. Since it did not actually circle the central star, and it had a very fast rotation, it had very short 'days.' They noticed a faux 'sunset.' Sette, the new cadet was also suited up and out the airlock and she got to analyzing the crust. She turned to them both "This is weird. It seems that the crust of made of a single compound." Piteer rechecked. She was right. It was all Calcium Carbonate......chalk. Fenie sent out a robotic probe though the airlock. the contraption was quite useful in geological surveys. Dranke picked a spot and 'shot' the probe into the ground using an air pressure expulsion tube. The probe was a small ball which had a tough shell and held nanobots which would disperse into the soil and carry out analysis deep into the crust. They 'ate' their way through the soft soil and scanned their environs, dispersing widely into the crust. In a short while, they were able to send a visualization. The scans were accumulated and reconstituted in the Raven's bridge in holographic splendor. Fenie was staring at the holograms in consternation as they spun around lazily in the center of the deck. Her voice carried in their suits as she said shakily "Captain, the planet is artificial. I repeat. The planet is artificial. The core is a construction." 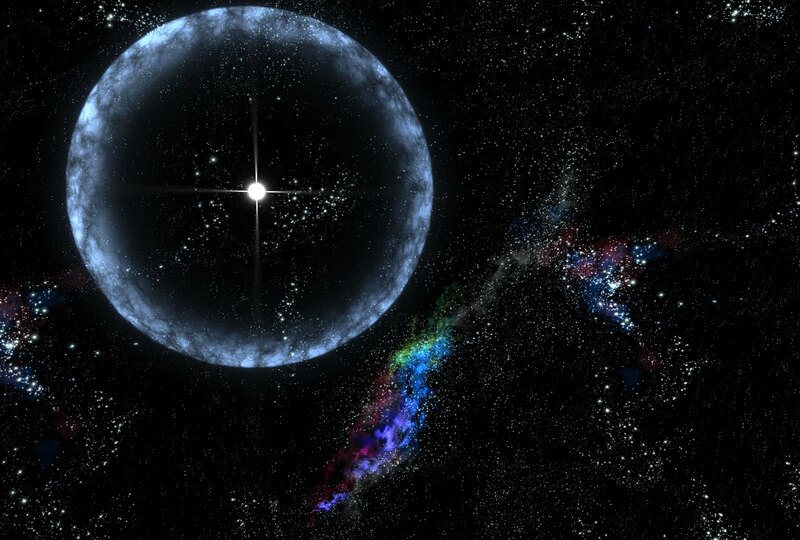 Pic courtesy: http://goo.gl/Vg4iun (NASA Goddard Space Flight center. 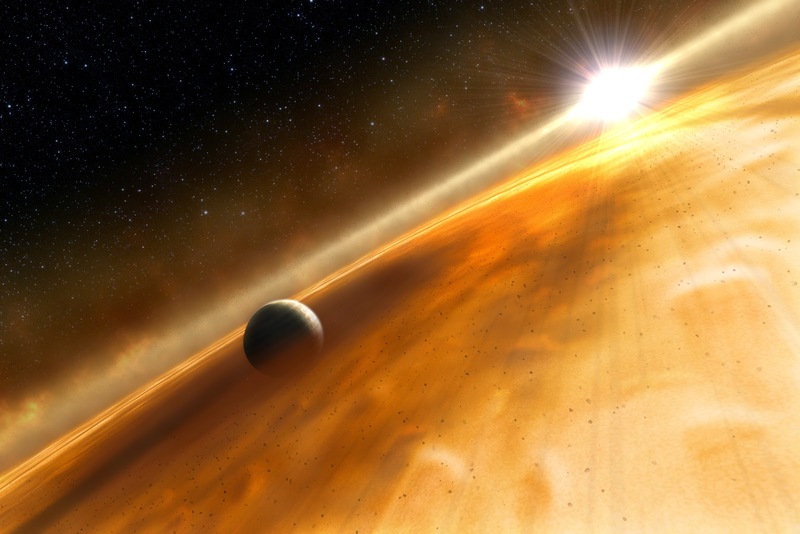 Artist's impression of Exoplanet HR 8799b). Piteer lashed himself tighter to the Raven's airlock handle and waited as his shipmates came up to where he was hanging. Fenie stared beyond him "The shadow looked almost like a large bedsheet." Vaxe disagreed "I thought it looked like a manta ray." They strained to see anything in the gloom, which was accentuated by the methane clouds which made it look almost monochrome blue. Dranke, the captain and his crew had pushed their darkmatter starcraft, one of the first of it's kind to chase down a mysterious species called the Hnnet. The aliens were highly advanced technologically, and starcommand had tasked the Raven and her crew to track down the alien species. 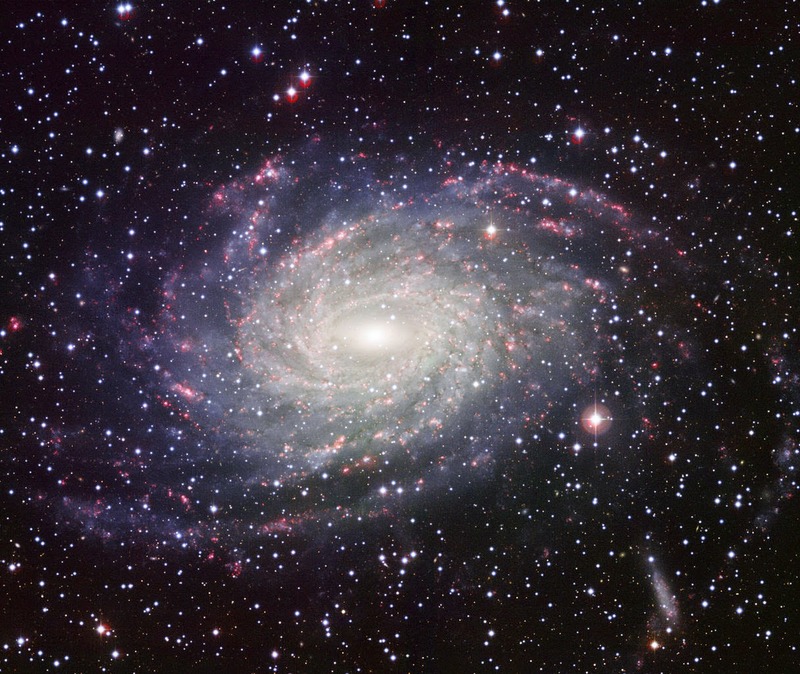 Dranke had chosen the Sagittarius satellite galaxy as the most likely candidate, and they had begun their search. Vaxe got out of the enclosed amphibian vehicle and got out an optical enhancement which was only visible-spectra dependent. It allowed for color and temperature differential. She scanned more closely. In a few seconds, a black giant teardrop shaped creature broke the surface of the methane sea and seemed to be studying her. Piteer stifled a cry and stared, his eyes wide. Fenie was the only one who moved. She slid her suited hand into the methane sea and looked at the creature. It came around to her and enveloped her hand! Vaxe whispered "Be careful." Dranke came out of the airlock and closed it behind him carefully. Before he said anything, the shadow creature slid off Fenie's suited hand and 'flowed' over to Dranke. It covered his foot. It tingled. Dranke tried the normal spacecommand protocols for communication. It did not react. In a few minutes, it slid off his foot and disappeared into the methane sea. Drake looked mystified "What does one make of this?" Fenie shrugged "It looks like a marine creature. Also it doesn't seem to want to communicate. At least not in a way we can discern." Vaxe agreed "Not much we can learn here." Piteer untied himself and got into the darkmatter starcraft last. He was still looking a little uneasy. "Maybe we should try and get some more information? It seems to have some basic intelligence." Dranke grinned "It's not the Hnnet anyway. That was our task in the first place. Not this alien species. Anyway I will cover this in my report to spacecommand. If they want us to come back here, we can do that." Decision made, they got the Raven prepared for launch. It was harder to launch from a liquid methane sea, but they had some experience with the protocols now. The crew moved in unison and got the Raven ready, while Fenie was already mapping their way to the next port of call. The star system they had chosen would have to be a flyby. They were going to study emissions from space and look for telltale signs of electromagnetic emissions, the signs of civilization. On Mesc, the Mescieans were 'chattering' to themselves using vibrations..... they flowed over each other as they communicated. Raven had been loaded with the instructions for the route to the next star system which Fenie had built into the route map. The jumps had been automatically recalculated by the computer on-board systems and Dranke had finally signed off on the parameters for the jumps. The mission was progressing on the darkmatter starcraft and Dranke was cautiously optimistic that things were looking up. 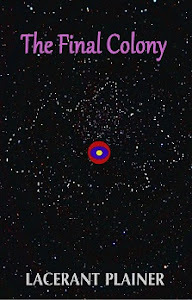 The Raven, the newly named darkmatter starcraft, and the Captain and his crew had been exploring the Sagittarius Dwarf galaxy in hope of finding clues to the Hnnet, who had been on a mining expedition which had come close to Sol before traversing the galactic disk of the Milky Way. They had played a cat-and-mouse game with the alien fleet in hope of learning about them, but had been confronted by the vastly advanced extraterrestrials who had beaten them at their own game. An alien calling himself 'Ed' had met with them, leaving both the crew of Raven as well as spacecommand with more questions than answers. Fenie and Piteer were arguing about something, just out of earshot, and Dranke saw multiple starmaps being pulled up and marked with different colored tracer lines which were route maps which were based on the current overlay. There was a lot of gesticulating from Piteer. Dranke sighed "What is it?" They looked up, surprised. They were in their own world. Piteer shrugged "We can't be sure if we want to jump and stop and scan the area or scan the area without jumping." Dranke grinned "Whatever is faster. Run the simulations." Vaxe walked in and without missing a beat said "Sette is already on it. And Dex is running the scans. But it's taking time." Dranke thought about it "In the meantime do you have a candidate? 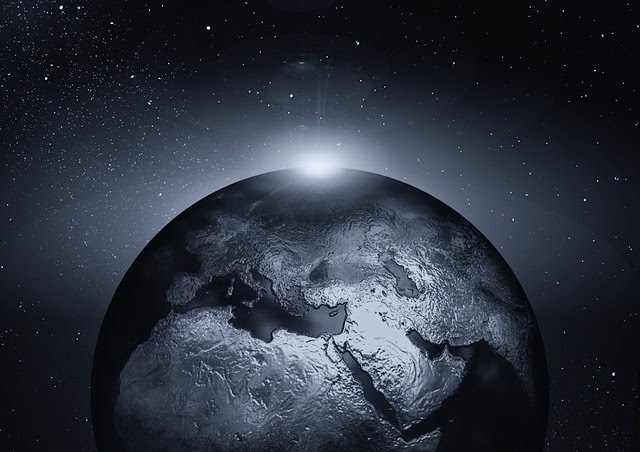 Instead of waiting around, maybe we can stretch our legs on a planet." Fenie pulled up another starmap.... It was beginning to look crowded with all the holograms jostling for space and getting overlaid on the bridge. She pointed "We got this planet.... it's not Earthlike, but it has an atmosphere, mostly liquid methane. We can't see any EM, but the planet is bathed in methane clouds. It's worth a look." Dranke stood "There you are. Lets take a look around." 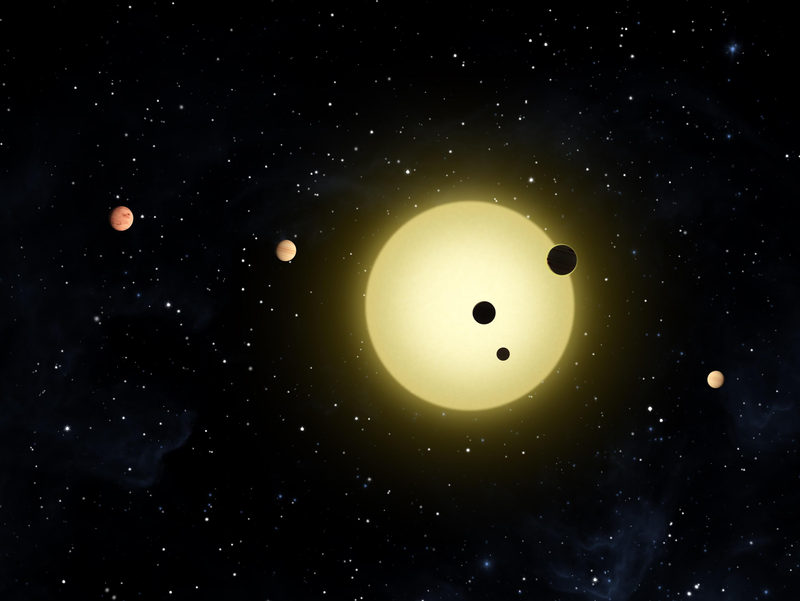 The crew had gotten much better at looking at potential planets where alien life could exist. They had shortlisted them by type, emissions, suspicious megastructures or moons and any clues they could find in the neighborhood. Size and temperatures were also inputs, but secondary. Fenie thought nothing of it as she and Vaxe kitted up. Piteer would stay near The Raven and the captain would stay with the ship this time around. They kitted up. After visiting over thirty planets, the protocols had got much smoother. They were ready in a few minutes and the ship was at alert as the planet came into view. It was beautiful. 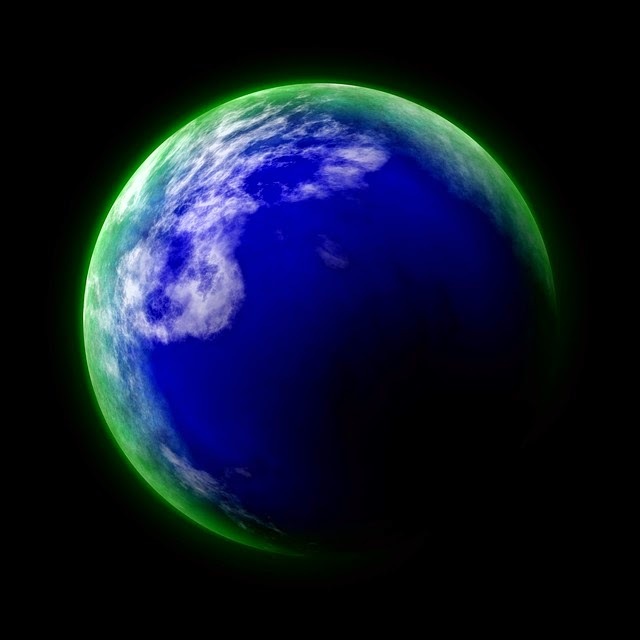 The methane gave the planet a bluish green appearance. And they quickly went through the outer clouds. Fenie sampled the atmosphere. "As expected, it has a high methane concentration. All other gases are trace." They waited for the ship to drop. The pinging told them they were close to the planet surface. It was a gooey muck of blue-green, with very little visibility. Dranke checked "Can't find solid ground, we are going to have to land in the methane sea. Use the amphibious craft for planetside exploration." They listened and adjusted their apparatus. They had seen all this before. It has been a long time since they had first set foot on an extraterrestrial planet. Fenie and Vaxe were in their amphibious outfits and the craft closed over them like a skin. They waited for Piteer to step into the airlock and they closed the hatch for the air to cycle out. Without much ado, they were floating on the methane sea. It was surreal. The 'water' was methane. The sky had thick methane clouds, and in the sea, there were methane-bergs... it was over a hundred and fifty degrees below freezing. They looked around and scanned the horizon. Nothing. Piteer looked like a dot on the huge darkmatter starcraft. He was precariously positioned near the hatch, but Fenie knew he was securely stationed there. She waved out and scanned him. Just behind him was a shadow... and then it was gone. It had been fleeting. She told him to look and they started back to where Piteer was lashed to Raven. Dranke stared at his screens showing a simulated approach to the Planet which resolved to be more brown than purple. Maybe it was something in the atmosphere which reflected light in the purple area of the visible spectrum. He checked with Fenie. "Sir, atmosphere analysis is ongoing. But we did not sample the outer atmosphere since it was not relevant." She looked rushed, and Dranke decided to leave her alone. Piteer moved to the pilot's chair as he switched on the standby systems to account for any surprises. Vaxe had moved into Piteer's seat as she kept a close eye on the outer hull. Dranke smiled. This team of young space recruits were acting in concert like a well-oiled machine as they orchestrated the delicate landing process. It was the first time a darkmatter starcraft had been made to land on an exoplanet. And watching them, he knew his team was what he had hoped it would be when he had first stepped on the Raven's deck. His musings were interrupted as they passed though the last of the thin atmosphere and the planet's topography became apparent. The Raven's wings were now extended for the first time as they glided down to the surface.... it was a perfect landing. And they had landed on what looked like a tabletop mountain. Fenie was scanning for anything around. "Is the atmosphere breathable?" Dranke asked. Fenie shook her head "No. We need to be careful. Oxygen is non-existent. Vaxe and Piteer were already in their suits and they looked like a pair of fish in the form-fitting metamaterial outfits. Dranke grinned "Wait for me." He kitted up quickly and the three of them went through the tedious airlock cycling procedure. It hit them hard. The planet was a desert. There was no vegetation apparent. Just the same rough unbroken terrain. And a pinking hue in the sky. No water bodies were apparent. It matched with their inability to ascertain any electromagnetic emissions from space. Dranke was already relaying information which would help them filter things in advance. The lip of the table top was just a few hundred meters away and they walked over to check if there was anything of interest down in the 'valley' area. A few minutes and they realized it was just the same. Vaxe had established a link and she uploaded images, spectrographic analysis and hard data to the ship's memory banks. Dranke did not waste any more time. Any advanced civilization would have been easily discernible. He led the way back. The awkward gait in the slightly higher than Earth gravity made them look like a trio of clowns. Fenie welcomed them back. In short order, Fenie was retracting the landing gear and the ship was tilting upward. The wings were swept forward for the launch and in a few seconds, the propulsion systems pushed the Raven upwards and the ship righted itself as it flew into the higher atmosphere. Dranke said "We need to be able to scan planets better. Piteer and Fenie can work on the parameters I uploaded while planetside. Get Dex and Sette to work on trial runs. And lets do a sweep before we decide to land." They crew nodded soberly. They understood that the Captain did not want to waste any time and effort. The trip had been wasted, and it was impossible to comb every planet this way. The sensors should be able to give them a better idea if a planet was likely inhabited. They were in a high orbit around the planet and they planned their next jump. There was so much to do! Dranke looked forward to it......they were just beginning their adventures in exploring the Galaxy. Ed had been right! Fenie had been up beyond 'nighttime', which was the simulated shiptime. The darkmatter starcraft had seemed to hum in the night, though that was clearly her imagination. The humming would have only occurred just before a jump. Not a constant hum which she seemed to hear all night. She had finally been able to plot a spidery line to the nearest galactic disk... after traversing the dwarf galaxies which had seemed like little pearls. They had crossed incredible distances. Sagittarius dwarf lay ahead, it was a satellite galaxy. They would visit this first, since the Hnnet seemed to come from there. Extrapolating the vector backward was not the best approximation, but they had nothing else to go on. Fenie had almost passed out from exhaustion. She had left a ping for Piteer to clear the flight plan with the captain and had staggered off to bed. Piteer was just getting dressed in his fatigues, and he rushed though a quick breakfast of pills. Always the pills in space. He hurried off to his console just as ship 'day' broke and the lights brightened. He felt fresh and rested. Dranke was already at the bridge, checking their progress, He looked up "Hey Piteer. Get yourself caught up on our flight plan which Fenie has mapped and lets get to business. I want to scan planets which could be likely targets. Look for unexplained radiation emissions." He went back to his dark coffee analogue and his screen as he spoke. Piteer nodded unnecessarily "On it boss." Dranke and his team had quite the adventure, finding an alien fleet on a path which seemed to go to Earth. 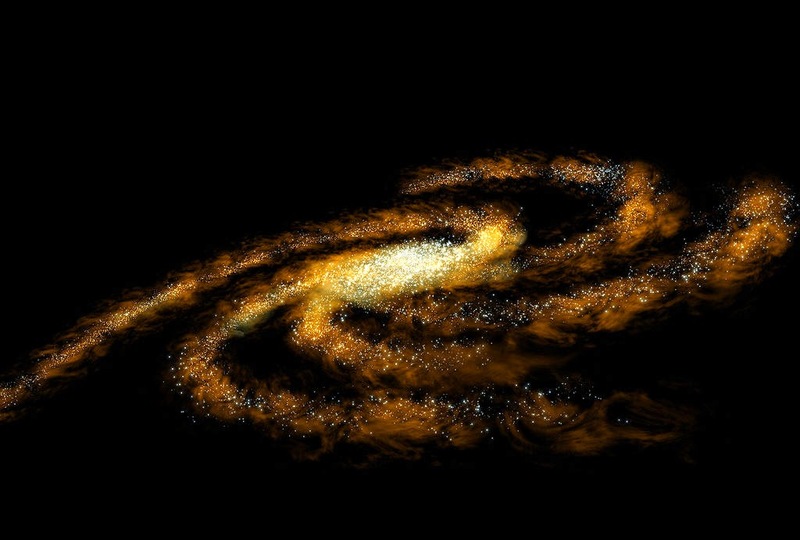 Instead, it seemed that the alien fleet was a mining expedition which just happened to come close to the Sol system, before traversing the galactic disk of the Milky Way. The aliens had confronted Dranke's darkmatter starcraft; and raised more questions than provided answers. But now spacecommand knew there were extraterrestrials out there. They would not rest till they found them. Dranke and his crew were tasked with tracking them down. Piteer pulled up the starmap and drew lines across the grid pattern overlay "I have over ten thousand solar systems which could be targets. We need to filter them Sir." He looked at Dranke in askance. Dranke sighed. "It's hard to eliminate targets based on Goldilocks zones. The aliens obviously do not share our physiology." He pondered the issue. "Instead of planets, can we look for artificial structures? Anything that could be a power source for example." Piteer nodded "We have only about twenty outliers. Something strange in all of them. Let me plot a course to the nearest one. In merely a day, they would traverse a distance which all of humanity had not been able to do in all history put together. And ahead lay a nondescript solar system. The only strange thing was it had a trinary star system. And multiple planets. Piteer had chosen well. Two new crewmembers Dex and Sette were being trained on the starmaps and feeding in variables for the mapping of routes. They were working well together. It was a game for them. It was always that way for new recruits. After spending three years on simulators and game consoles that prepared them for the darkmatter starcraft, they knew how it all worked. But the reality was something they had to come to grips with. That piloting the ship involved real dangers, and jumping into a star would not just end with joshing in the mess, but would be fatal. Fenie was up and getting a hot beverage. The pills were never enough. She ignored the fact that all liquid had been recycled. Some of it was used to protect them from space radiation and filled the walls of the ship. Other water was cleaned, filtered and reused. They were literally an ecosystem by themselves. She plodded to her console and looked at the approaching trinary system. "Captain, are we planning to land?" Dranke looked up from his console and nodded "Soon now." It looks like there is no electromagnetic emissions from the planets in this system, but my plan is a quick in and out on one of the planets." He marked out the planet he had chosen. The blue planet rose in the viewscreens as they all gathered around to watch 'Earthrise.' It was a purely artificial construct, but it was still amazing to watch. They had been in space for almost six months and Dranke and his crew were looking forward to some downtime at home. Spacecommand was floating in a distant Earth orbit, but for once, they would not be docking there. Instead, the ship docked at the maintenance yard which was in a near Earth orbit. The crew filed out as they exited one airlock and entered another. The maintenance docks were huge and they stared at the scale of operations as they trooped towards their waiting capsule. Dranke and his team had been involved in some notable firsts over their last mission. Having tracked and chased an alien fleet clear across the galactic disk, they had continued on their original mission, only to find that the fleet had doubled back after giving their trackers the slip and ambushed them. What the aliens had wanted was not very clear, but it seemed that they were on a mining expedition originally. 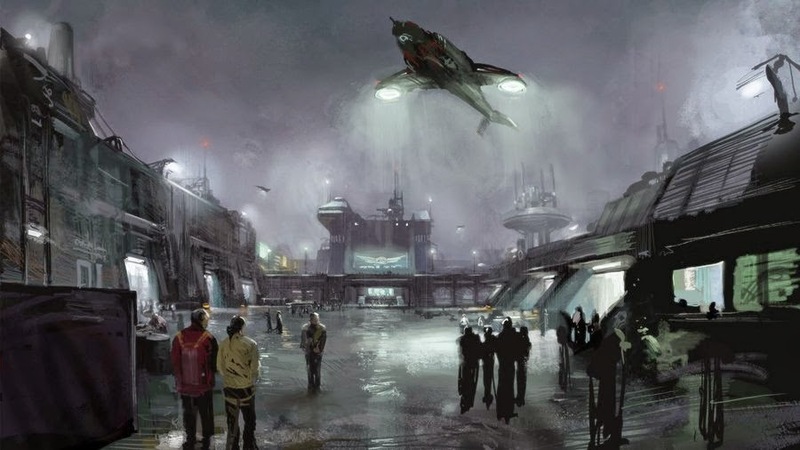 After they found that Dranke's darkmatter starcraft was tracking them, they had in turn given chase to the ship and confronted Dranke and his crew. It had been quite a shock. Vaxe and Fenie talked animatedly as they discussed the encounter with the alien and Dranke walked silently to the capsule, shadowed closely by Piteer, who was talking away. Dranke heard none of it, he was too caught up in his own thoughts. The 'capsule' was a sheathed vehicle, thickly layered and powered by lasers. They stepped inside. It moved off almost immediately. A bank of 200 high-powered lasers were aimed at the bottom of the capsule, which was protected from below by a reflective surface. The capsule moved downwards and soon they were on the ground. A Sargent led Dranke, Vaxe, Fenie and Piteer to where General Selin was waiting for them. The rest of the 20-odd crew were allowed to carry on to their debriefing officers. General Selin was dressed in his battle fatigues, which was a surprise. Dranke shook hands with the General and introduced Vaxe and Piteer. Fenie had already met the General in cadet school and she saluted smartly. The general returned the salute perfunctorily "I read the report. You needed to get more detail on the aliens. Were they a threat. What did they seem to be like. I need everything." Dranke supressed a smile "We couldn't read the alien. It transformed from a orb-like shape to a quasi-human shape, which was obviously supposed to put us as ease. They are extremely advanced, far beyond what we can imagine." He went on to tell the details of the meeting, the kind of docking which was done with an extrusion of the ship's walls and the liquid-like alien fleet which seemed to be almost ethereal. "They seemed to know we are just beginning to explore, and they did not give anything away. In my opinion, they don't seem to be aggressive. Just curious." The General nodded absentmindedly "You have a week off officially, but we need to know about these Hnnet. Was the alien you met in contact with someone while talking to you?" Fenie said "Ed. He asked us to call him Ed. Though his alien name was something else. But to answer your question, Vaxe was unable to figure out if they had any communications. Our own systems were jammed completely." The debriefing with the General seemed to last forever. He asked for details every few minutes. Finally their story was accepted. The General's aide had recorded everything and he walked away with his data, which was sure to be replayed time and again. General Selin was not amused. He dismissed them with a parting shot "It seems like the aliens want to talk to you and your crew. So for better or worse, your crew has been chosen to gather intelligence for us." Dranke decided to give them the day off, and they all left excitedly to enjoy it. It had been some time since they had been able to relax completely, and all too soon, they would be back marking time as they traversed this galaxy and the maybe all the neighboring ones too. It would make for interesting times! Before very long, they were called back to the Earthbase to rapidly leave for their next mission. Fenie was the only one grumbling as she hadn't quite been able to attend a concert which she been looking forward to. Vaxe shrugged, "we knew it was going to be short notice. The boffins are jumpy." It was a familiar feeling to be back on their darkmatter starcraft. The bridge had been cleaned and the full ship had been serviced. They settled down and prepared for the long voyage. Fenie said "lets name the ship." Dranke grinned "Let's have a vote." They jumped. And jumped again. And again... leaving the Sol system in the distance. 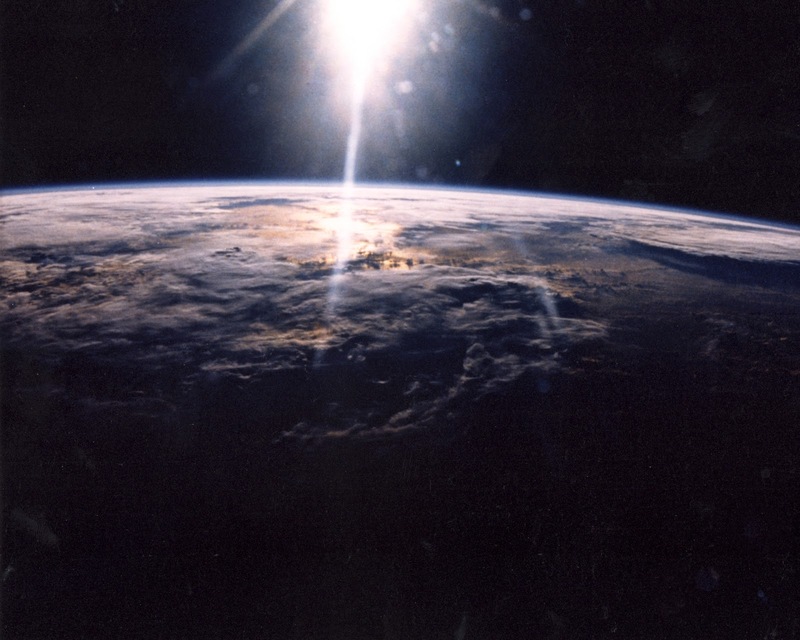 Pic Courtesy:By NASA (Great Images in NASA Description) [Public domain], via Wikimedia Commons.. Licensed under Public domain via Wikimedia Commons. Vaxe had the coms ready. Since the aliens were only able to use text, She would have to manage to convey what they wanted to the alien fleet in a similar mode. Dranke stared at the screen, frozen in time. How should one answer? It was too open a question. Thoughts of cliches like We come in peace ran through his head and were discarded. Maybe it would be better to say Hey, how are you. We are humans. Nothing seemed appropriate. After a long chase from the edge of the Milky Way galaxy, Dranke and his crew had tracked the alien fleet due to their suspicious trajectory which had seemed to take them straight to Earth. When Dranke had found that the aliens were not headed to Earth, the chase had taken on a new complexion. They were then tracking the aliens to see where they were headed. The aliens had given another darkmatter starcraft the slip and sneaked up on Dranke's starcraft without warning. The last message they had sent was "Who are you?" Fenie was working on a reply as instructed by Dranke. She said "How about this... we are Humans from a the Sol cluster. We were curious about you." Dranke chewed on that for a few seconds and then nodded. They were too far from Earth for anything approaching real-time communications, but he asked Vaxe to send a tracer com to spacecommand appraising them of the situation. She turned back from her screen "I can't send a message to spacecommand. The aliens have jammed all coms except to themselves." Dranke stared at the visuals of the alien fleet. They looked beautiful. Ripples seemed to pass over the spaceships as they idled. The material was fascinating. Almost hypnotic in it's beauty. What was he supposed to do? Maybe he should just tell the aliens he had no authority to speak to them. But this was a once-in-a-lifetime chance. He would have to wing it. He was actually speaking to the first extraterrestrial intelligence in the known Universe! He let that sink in. Fenie was looking at him and gesticulating. He looked at where she was pointing "Explain Humans." Dranke asked Fenie to send a long message explaining what Humans were about. This was in the spacecadet manual. Much easier to have the standard spiel which spacecommand had given them. At the footer he asked them to release their communications from the jammer. The Alien fleet remain impassive in the viewscreens. The next message said "Prepare for boarding." Pushy chaps was the first thought which entered Dranke's mind. He signaled for the airlock to be circulated as one of the alien ships came close. It ignored the airlock and a liquid extrusion of one of the innocuous rounded edges docked with the darkmatter starcraft. It extended right into the ship! The alarms went off. Fenie looked at Dranke significantly as she turned off the alarms. Dranke, Fenie and Vaxe waited near the edge of the liquid gateway which seemed to ignore all matter. The technology was way ahead of theirs. A round globular structure rolled towards them. English words were imprinted on it. "We are Hnnet. From the Hnnet Galaxy. Humans know Hnnet?" Dranke was just not prepared for this. He stared "No we thought we are alone in the Universe." The typing changed to gibberish imprinted on the globe. Then came the sound of a woman laughing. Then a man laughing. "Sorry, we are learning from your data and ship. Almost upto speed now." The globe changed to a man-like shape, mimicking Dranke. "You can call me Ed." It extended it's facsimile 'hand' and Dranke shook it. It fell cold and resilient to the touch. Dranke could not shake off the feeling of the whole thing being part of a prank. "Good to meet you Ed. Is that your real name?" Again there was a muffled sound of laughing "No. You could not pronounce my name. We are on a mining expedition. You followed us." Dranke said "Yes, we did not know there was another spacefaring species." He shrugged, just before remembering that body language was probably lost on the Hnnet. He smiled and the Hnnet smiled back. It kept smiling. "We would like to inform our planet of our encounter." Ed continued to smile "Of course. We would like to board your planet too someday." Fenie grinned at the awkward turn of phrase. Ed continued "You have just discovered space travel. I should let you explore." He turned, still smiling, and collapsed into a globe. Dranke yelled "Wait. We want to know more about you." Ed said distantly "In due time Human." The liquid extrusion pulled away rapidly, leaving no trace it had been there just a few moments ago. The alien fleet jumped away rapidly. They were alone again. Pic Courtesy: "Fomalhaut planet" by ESA, NASA, and L. Calcada (ESO for STScI) - Hubble Directly Observes Planet Orbiting Fomalhaut. Licensed under Public domain via Wikimedia Commons. Fenie had pressed Vaxe into service to ensure as close to real-time communications with spacecommand as possible, but there was still quite a lag. Even with quasar-assisted communications, they had to wait for responses. Vaxe indicated that she had managed to establish a secure link with a hand signal. After chasing an alien fleet across the galactic disk; no mean feat, even for a darkmatter spacecraft, they had realized the alien fleet was not aimed at Earth as they had first suspected. Instead the fleet had continued traversing the galactic disk and diverged from the path which led to Sol... and Earth. General Selin from spacecommand was speaking 'We noticed the alien fleet around two days back and pressed one of the other darkmatter starcraft which is still following the fleet, albeit from a distance which is at least three jumps away. It's going to be hard to be unnoticed." Dranke felt an anger coming over him, but he had to wait for the General to stop speaking "Sir, we have been tracking this fleet for some time now. Permission to track." He hated the idea of some other captain getting the chance to meet the first aliens encountered by humans. Fenie looked at him - part in amusement and largely in agreement as she nodded. This was theirs. By any yardstick. He grinned to break the grim tone on the bridge, even though he was seething inside. General Selin replied after a few minutes "Niket's starcraft is already on the job. It is even more important that you continue on your original mission now. Except we need to trace back to where the alien fleet originated. We have to know." Piteer walked across the bridge to where they were gathered and pulled up a starmap.. showing an estimation of the path taken by the alien fleet. But there were too many variables and red lines snaked across a number of galaxies. There was no way to be sure. They needed to know more. Dranke took it all in "Sir, based on a preliminary study, it looks impossible to be sure. It would be like searching for a needle..." The General cut him off, obviously transmitting simultaneously "We know that. I guess we are grasping at straws. I'm sorry. Your orders are to continue on your original mission." The transmission cut off with the standard signal for end of communication. Dranke looked annoyed "You heard the boffin. We go back from where we came and triangulate our best guesses for point of origin." Life returned to normal pretty quickly and took on the usual boring space travel motif, Except for the spectacular views as they zoomed out of the galaxy with each successive jump. They went back to the usual shiptime cycle, mimicking the Earth's The card games which had taken a back-seat in the past few days broke out in full force again. Dranke toyed with the idea of taking a wild guess at where the alien fleet came from. He stared at the maps again and again. Without any preamble the ship's red alert buzzer began ringing loudly. Fenie was running to her post, as was Piteer, followed by the navigation and piloting crew, who had abandoned whatever they were doing. They rapidly began to scan for the reason for the proximity alert. They were being hailed. The alien fleet! It had doubled back and was now tracking them. 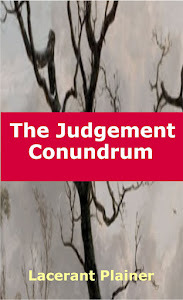 Dranke felt a knot in the pit of his stomach as he realized what had happened. The alien fleet had seemed to evaded the other darkmatter starcraft and must have given Niket's crew the slip. He swore. He remembered that there had been a chapter on extraterrestrial intelligence in the cadet manual, but it assumed they would happen on some form of life on a planet. Fenie looked at the hailing signal - it was gibberish - she could not discern any pattern . Not good. This would take the translators forever to crack. And that was with a lot of luck. The alien fleet gleamed in front of them. The spacecraft seemed to be almost liquid. The shape blurred and flowed as if made from water. There was nothing to do but wait. They were outnumbered. Should they make a run for it? He was transfixed. Fenie yelled "They are accessing our systems. And the attack has shut down everything. Too late to run if that was in your mind." Dranke had never felt so helpless. He was a man of action. Waiting was not his strong suit. He needn't have worried. The words on the screen which scrolled down were chilling, and seemed to echo in the ship, even though it was just in text "Who are you?" Jumping in space was a complicated business. It required triangulation of a group of stars, matching against the existing star system, taking into account the time taken for the jump, and avoiding any gravity wells during exit. This made for a fun discussion between Dranke, his navigator Piteer and his Science officer Fenie. But their predictions did not evoke any merriment. The fleet of alien ships they had spied jumping inward towards the galactic disc had looked menacing. And they had seemed to be heading straight towards Earth. Home to humanity. Fenie did not know what to feel. All her life she had imagined aliens; and now they were heading towards her beloved Earth. It did not feel like an adventure. It felt like the end. She yelled out unnecessarily "Brace for jumps" as the black darkmatter starcraft jumped inward, mimicking the path the alien fleet had taken. It was a grim game of cat and mouse. Dranke looked at the starmap with foreboding as he watched the jumps making a spidery trail towards Earth. It looked very similar to the alien fleet's path. He asked Fenie for an overlay. Fenie pulled up a larger starmap showing the alien fleet in red and the darkmatter starcraft in blue. Their paths intersected a number of times. Dranke swore and asked for further readings. They had been tracking the alien fleet for over two Earth weeks now, and it was getting to be a continuous war with sleep. He had to see this through! They had shot off a communication to spacecommand, but for all practical purposes, it would only be received much after they reached Earth. It was a marker, Dranke consoled himself. It would be received by the other darkmatter starcraft in the area surrounding Sol. There were two others. Though Dranke's team was the only one to have left the galaxy. He had headed off to bed. There was nothing more he could do. As he left he watched Fenie and Piteer were creating tracer lines on the starmap. They were looking at alternate predictions. He would get a few hours rest and plot the remaining jumps home. They were hot on the heels of the alien fleet now. Dranke woke from his nap drenched in sweat. He had had a nightmare about failing in pilot class. He stretched and shrugged off the dream. He knew exactly what it meant. Dranke threw on his comfortable soft battle fatigues and padded onto the bridge. Fenie had knocked off earlier. Piteer nodded an acknowledgement "We are just three jumps away from the aliens. We could push for larger jumps and catch up with them, but we lose certainty with longer jumps." Dranke processed the information without stopping "No, just keep plotting. We are almost in the vicinity of Sol now. I want to keep watching the alien fleet. Do not engage." Piteer took his leave and Fenie took over the controls. They had to now work in rotation. No sense in losing people to fatigue. Fenie suddenly stared at Dranke as his face broke out in a huge smile. 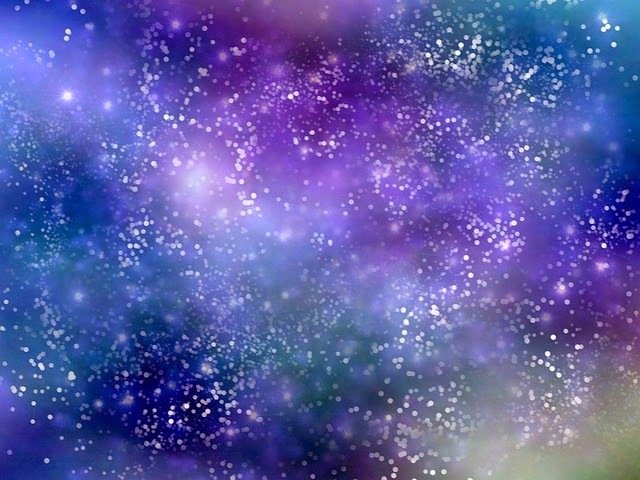 Dranke looked at the starmap to see what she was indicating and before he could react, Fenie yelled out "They are diverging from the galactic disc.... heading past the Sol system." She was now grinning idiotically. Dranke felt like an idiot himself. He scowled. "Track them and lets get some communications going with spacecommand. I'm sure they will be very interested to know there are other intelligent beings in the Universe." He slumped in his chair, the tiredness taking over as the tension seeped out of his muscles. He was glad it had been a false alarm. Then it sunk in.... humans were not alone in the Universe!